Q. What do I do when I have a tech support question, and I don't see an answer in the program help files? Q. If I order the CD, will I also be able to download the software ?/span>? Q. What if the download was not successful or if I wasn't redirected to the download site instantly? Q. Can I download / install the software on more than a single computer? A. Yes - up to three PCs, provided that several people are not using the software at the same time and that none of the PCs are publicly accessible. Typical 'configurations' that we have seen are (1) home computer, (2) office computer and (3) laptop. If you have a specific situation where this is not going to work for you, let us know and we can work something out. Q. I got billed twice - what's the deal? A. You must have pressed the order button twice, or mistakenly reordered when you just wanted to redownload. Contact us and we will fix it. Q. Can the software do word problems? Q. The answer Algebrator gives me is different from what I get from my book / teacher / .... How come? A. There are many different ways to solve a problem and display the solutions. In most cases it is just a question of changing some setting (i.e. displaying decimal numbers instead of fractions). Contact us via tech support button (see above), and we will help you. Q. I am still deciding on whether to buy your software or software from one of your competitors. Convince me that your software is better. A. We can talk about virtues of our software till we are blue in the face, but so will every other competitor. This is our advice - carefully look at the list of the features , view as many animated demos as you can stand, review our history and if you like what you see, order the software. Remember we offer an unconditional money back guarantee, even on downloads. If you are considering any of the competitors, make sure you carefully review their refund policy. It tells you how confident they are in the quality of their product. 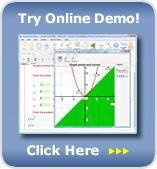 If you would like a personal comparison of Algebrator to any other product, let us know.